Oh No, the Weather’s Going to Be Superb! Government forecasters are apparently from a different planet. They think warm, sunny weather is cause for alarm. 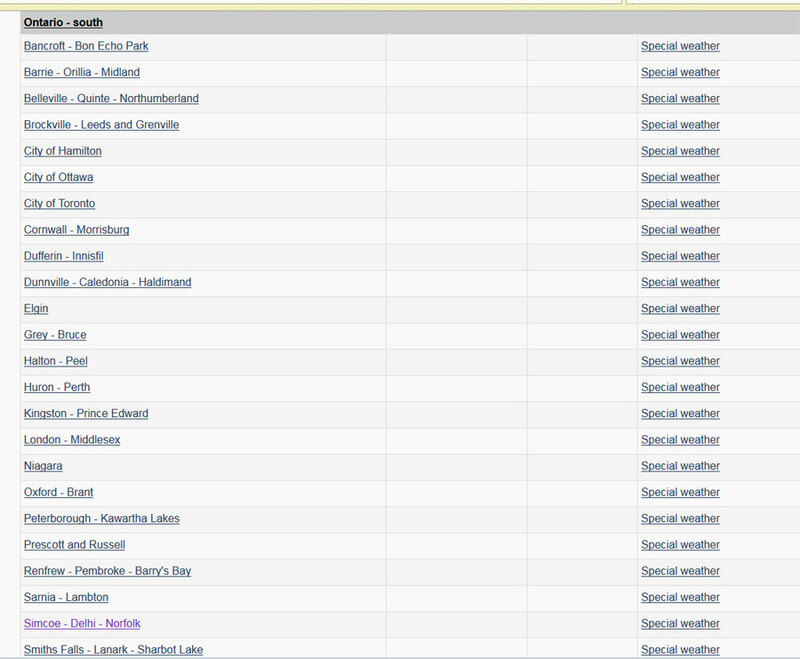 Environment Canada is my country’s official source for weather forecasts. Since frost, hail, torrential rain, tornadoes, and other natural phenomenon acutely affect agricultural production, and since this country exports large amounts of wheat and other grains, it historically made sense for the government to be in the weather business. But something has surely gone awry. The weather over the next few days in the beach town in which I reside is supposed to be gorgeous. At last. Our winter was cold, snow-laden, and seemed to stretch on interminably. A roofer told us yesterday he began work two months late this Spring. Nothing could be more soothing to our souls than a few days of sun and heat. First taste of very warm, mid summer weather today. The warmest air so far of this year is being ushered into Southern and Eastern Ontario by southerly winds. Under the strong may sunshine, temperatures this afternoon will reach the upper twenties to low thirties in most areas, making it feel much like mid summer. The first occurrence of 30 c or higher of the year is expected at many locales as a result. Humidex values will reach the low to mid thirties this afternoon. This is below the threshold required for a heat warning. Temperatures in areas along the shorelines of the still very chilly Great Lakes will be several degrees lower than the warmth to be experienced inland. Temperatures tonight will dip to the mid teens across the regions, providing some relief from the very warm daytime conditions. The very warm conditions will continue through Saturday as afternoon temperatures reach the upper twenties to low thirties. Humidex values in the mid thirties are expected. Latest indications are suggesting that temperatures will remain considerably higher than average Sunday and into early next week. Cooler air is forecast to arrive by the middle of the week. Please monitor the latest forecasts and warnings from Environment Canada at www.weather.gc.ca. Someone employed by Environment Canada actually wasted time writing and disseminating the above, 200-word “special weather” statement to us and approximately 30 other locales. Unknown thousands of Canadian citizens wasted our time reading it. And it says absolutely nothing other than it’s going to be a glorious weekend. Judith Curry thinks the topic of climate change is making us stupid. She may be right. Everything a little outside the norm is apparently now reason for government meteorologists to sound the alarm. This entry was posted on May 8, 2015 by Donna Laframboise in Uncategorized.